Is it hot out or what? This insanely oppressive heat has got this beauty chick longing for popsicles and flavored ice cubes. But in the meantime, here are the products I've simply been dying over. Rosebud Perfume Co. Brambleberry Rose Lip Balm ($5.59 at drugstore.com): I'm totally and completely head over heels for this one, fellow beauty chicks. Already a huge fan of Rosebud Salve (click here for my review), I was seriously hoping that this iteration would bring me the same joy. Well, happily, it does. The scent is intriguing and nostalgic all at once, with its blend of wild berries, honey and vanilla. Vitamin E and shea butter help to keep lips moisturized, and the deep berry color inside the tin translates to the prettiest rose sheen upon the lips. And the price just makes it all the more worthwhile! L L.A.M.B. 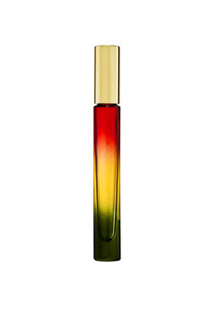 Fragrance By Gwen Stefani Rollerball: I've already taken to spritzing my entire body with the full-sized version of this fragrance, so the rollerball is the perfect addition to my perfume wardrobe. The scent is a delicious blend of woody and floral notes that just ooze sensuality. Notes like water hyacinth, white freesia and jasmine petals combine with musk and muguet -- and even some fruity ones like peach skin and fresh pear -- to leave your skin smelling absolutely divine. I love the rollerball size -- it's perfect for tossing in my purse and getting quick touchups throughout the day. Zoya Nail Polish in Audrina ($8 at zoya.com): It's creamy, it's vibrant, it's totally gorgeous. The color is described on Zoya's website as a red purple cream, but I would classify it more as a combination of fuchsia, magenta and violet. The shade somehow embodies all of these colors to create a totally unique hue I've been unable to find anywhere else. And as an added bonus, it's part of Zoya's Gossip collection -- and anything named after one of the gals from The Hills simply had to be mine! My fave attribute of Zoya polishes, though, is definitely the lasting factor. It's been four days, and my mani still looks as fab as it did on day one! Totally a must have.